As I mentioned a day or two ago I have just received a lovely selection of new Maileg things, and this morning I got up extra early to turn my spare bedroom into a photo studio and take shots of all the new products. 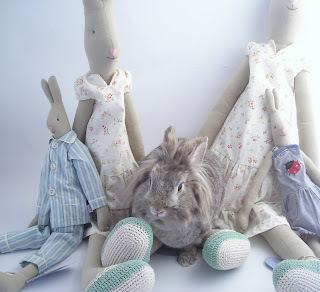 I will upload some of them later, but for now here is one of Humphrey having a chat with some of the fabric bunnies! Bless him, he was nosing around my feet the whole time I was taking photos, so when I'd finished I picked him up for a cuddle... and before he know it he was in my little photo cube thingy being 'papped'! cute photo, love all the bunnies!! Thank you for your nice comment on my page. Firstly thanks SOOOOO much for my bunny, she arrived yesterday but i hadnt had a chance to thank you till now. My girls adore her but they know shes special so mummy has put her on the mantlepiece for us all to admire. Charlotte you really shoudlnt have, none of uxpect anything back for putting a tiny ad on our blogs for you!!!!!!!! Hello! Your Humphrey looks a bit like my George! if you copy and past the link below in your browser it will take you to some photos of my bunnies. Or if you go to my blog and click on Decembers blog posts and click on "Meet My Bunnies" 2nd one from the bottom that will take you to the same place. I'm off now to check out your shop- thank you for stopping by my blog. I am doing OK thanks, I have had a couple of really bad nights with little one but my other half had the afternoon off and let me have a sleep and I am feeling soooo much better! Humphrey is very photogenic, how cute that he wanted to play! I think you will like my latest post with my goodies from Emma (Little Brown Rabbit). Love the photo so cute, Humphrey looks so adorable! I looked after my friend’s house rabbit when they went on holiday, so much fun and so cute like Humphrey. I hope you don’t mind but I have used your picture of Humphrey for your link on my blog it is so gorgeous. Have a lovely week end hun! Have you heard of them? They were so fantastic and so dedicated. I took Millie to them where she stayed for a week to bond with her new man. They like to bond them there at the rescue so when you get them home (back to her territory so to speak) she would have already accepted him. She is a picky little thing but it was love at first sight when she met George! I'm so sorry to hear you lost two of your bunnies recently. Which another great site and a fantastic resource. I think my comment is longer than yours now! Have a great weekend. The new Maileg products look great too! I've just come across your blog it's great, lovely ideas and love the bunnies. Hop over to my blog to see the bunnies I've made!